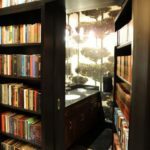 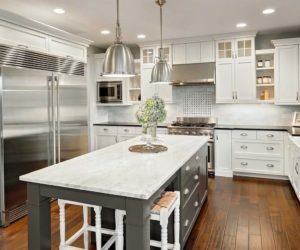 While granite has been the obvious choice for durable luxury in kitchen countertops over the past decade, there are so many other countertop options available today that we’re going to sidestep granite and look at other popular countertop materials. 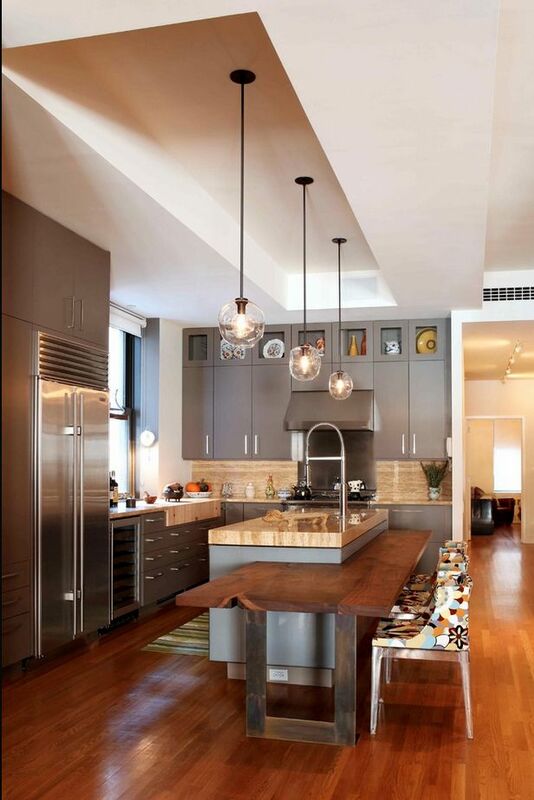 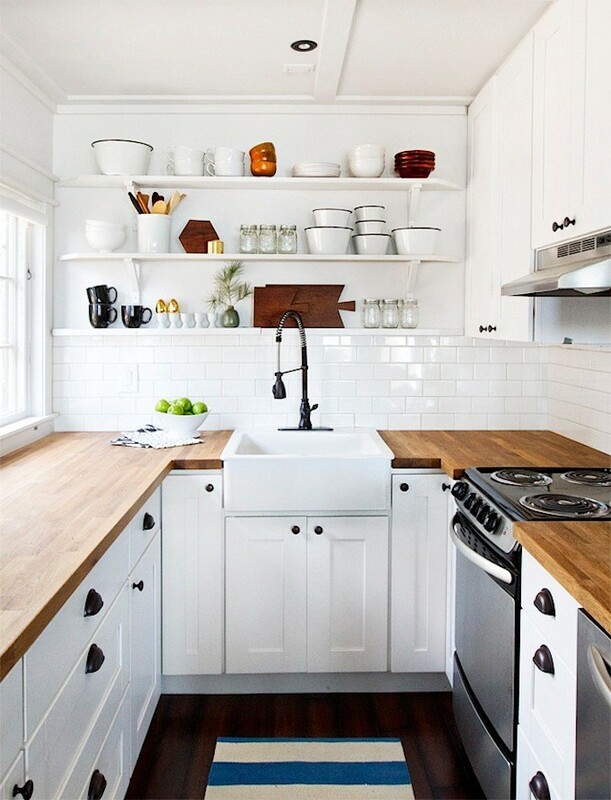 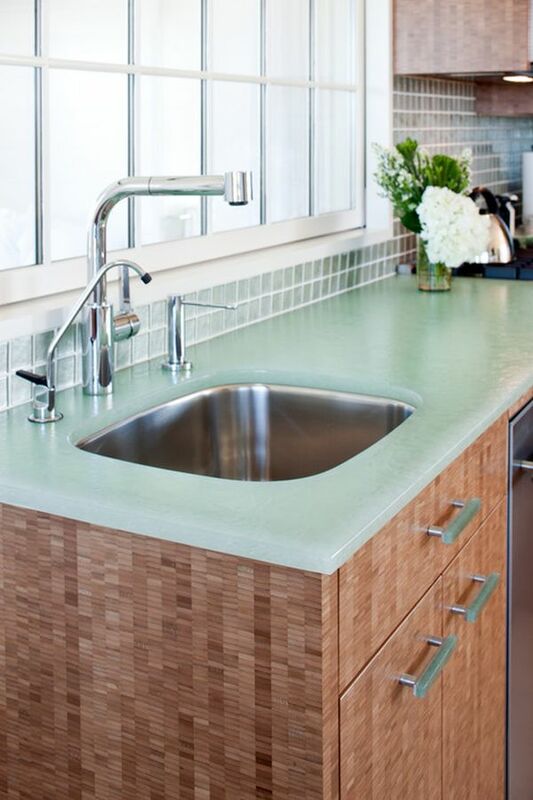 So, without further ado, here is a guide to the top 10 Most Popular Kitchen Countertops Today. 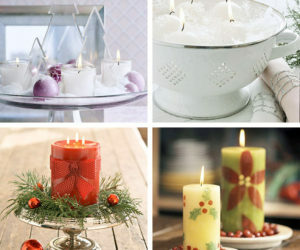 We hope you’ll find the photos inspiring and the information useful. 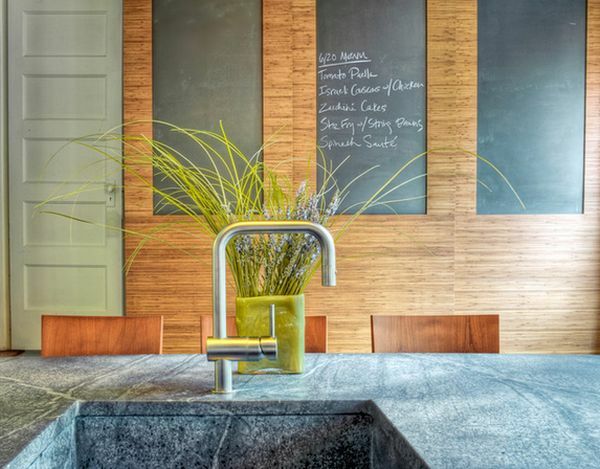 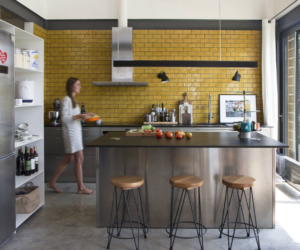 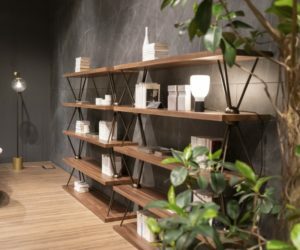 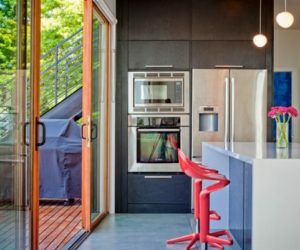 The past couple of years have seen a distinct trend toward the use of concrete in a variety of ways in the home, and kitchen countertops are no exception. 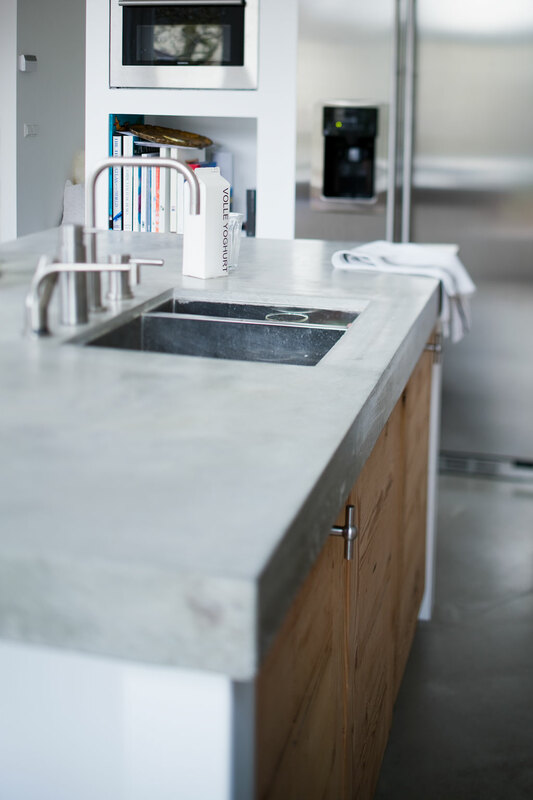 Concrete countertops are durable and, if sealed correctly, are pretty scratch- and heat-resistant. 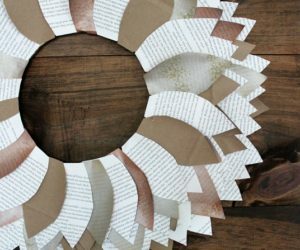 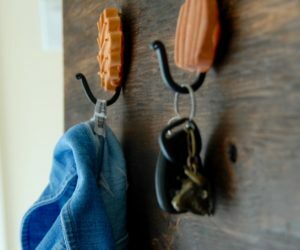 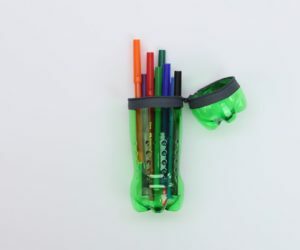 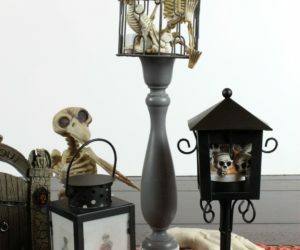 They can be customized for shape, color, and texture, which is a bonus. 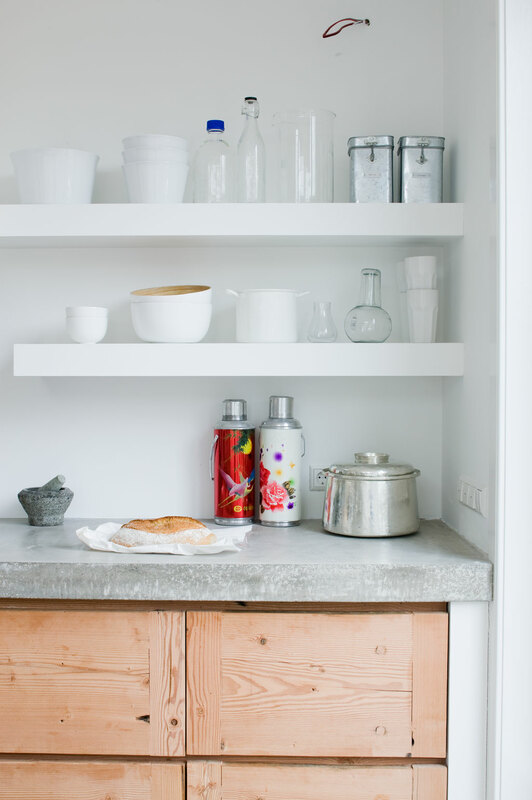 Concrete countertops are particularly heavy, however, so require substantial support by lower cabinetry; they also can be stained and/or damaged by acidic substances (think lemon juice). 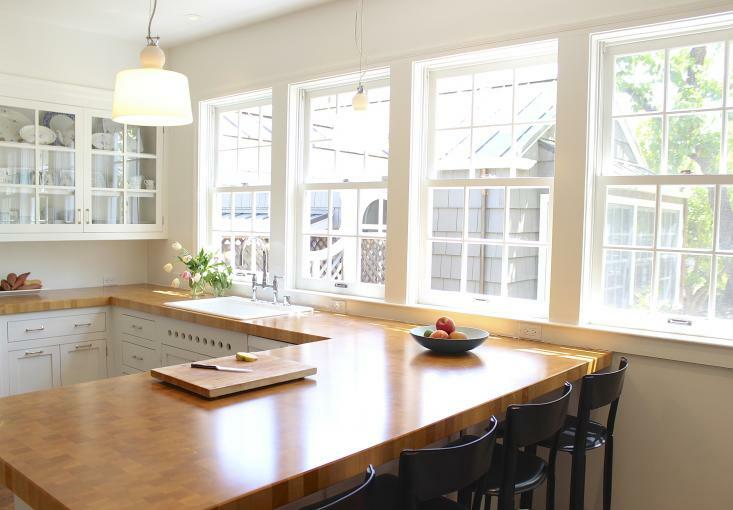 One of the best alternatives to granite countertops is factory-engineered quartz. 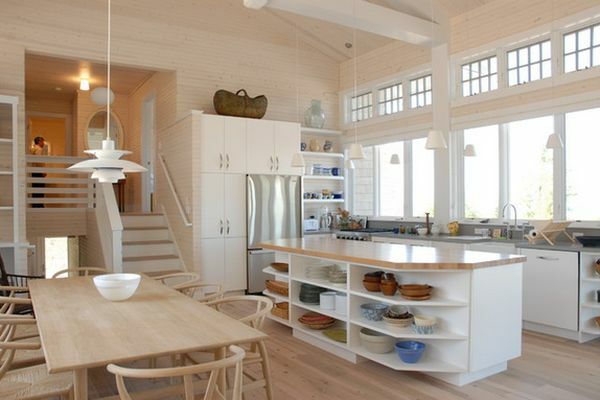 It is similar in look, is sturdy and durable, and is stylishly versatile in a variety of kitchens. 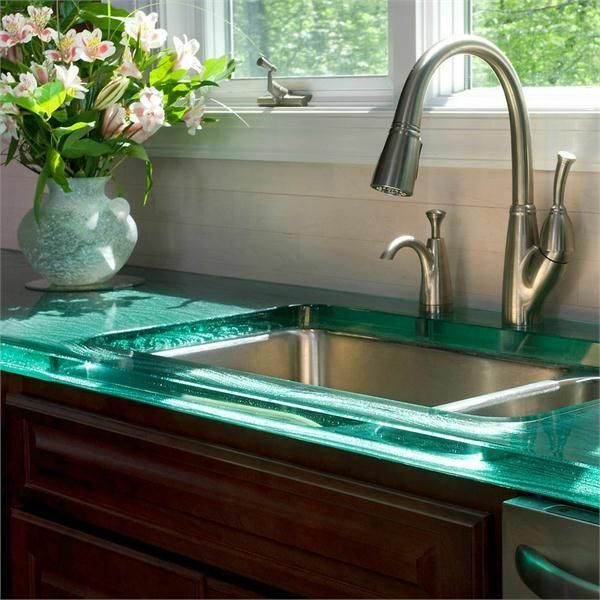 Quartz is a hard, long-lasting substance and its glossy surface is easy to clean with mild soaps. 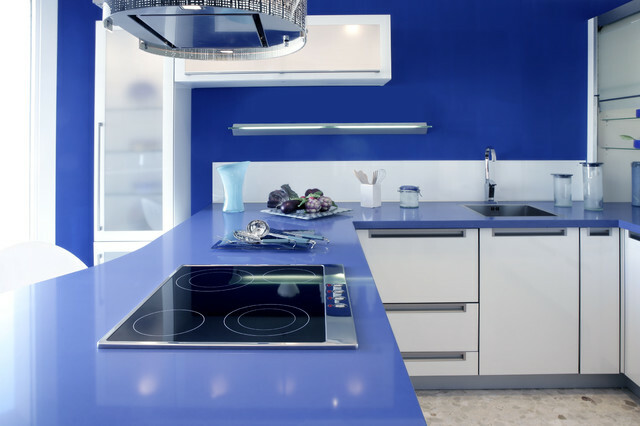 Bonus: quartz is low maintenance, neither requiring sealing nor resealing. 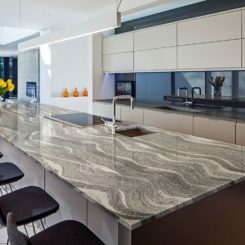 While recent years have shown stainless steel kitchen appliances to be all the rage, countertops of the same substance have been slower to materialize. 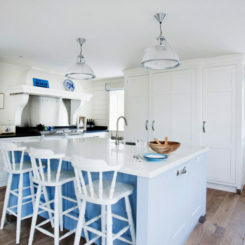 But they’re here now, and rightly so. 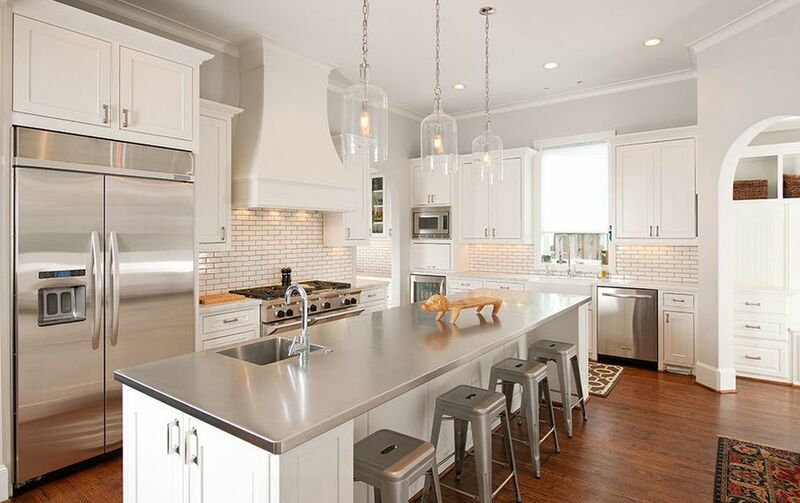 Stainless steel is an excellent kitchen material due to its stain- and heat-resisting capacity. 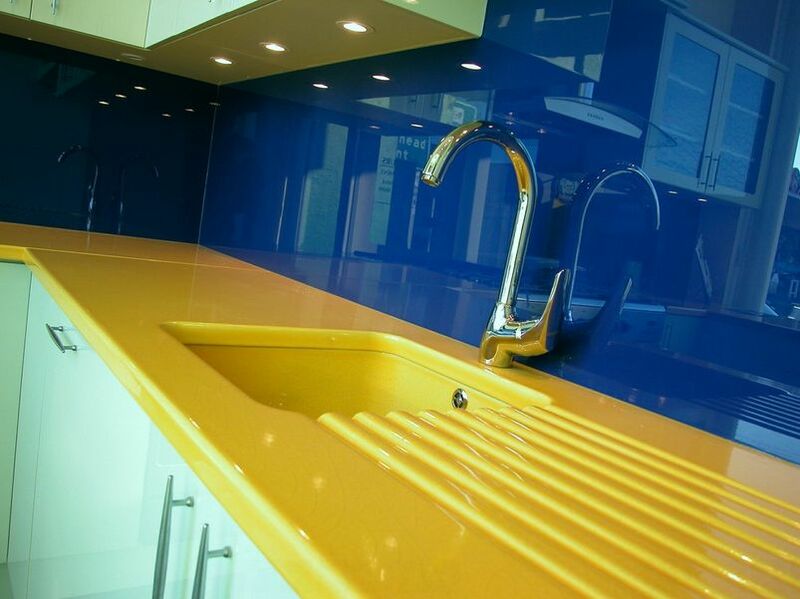 It’s also fully customizable to any specifications and can be installed without seams. 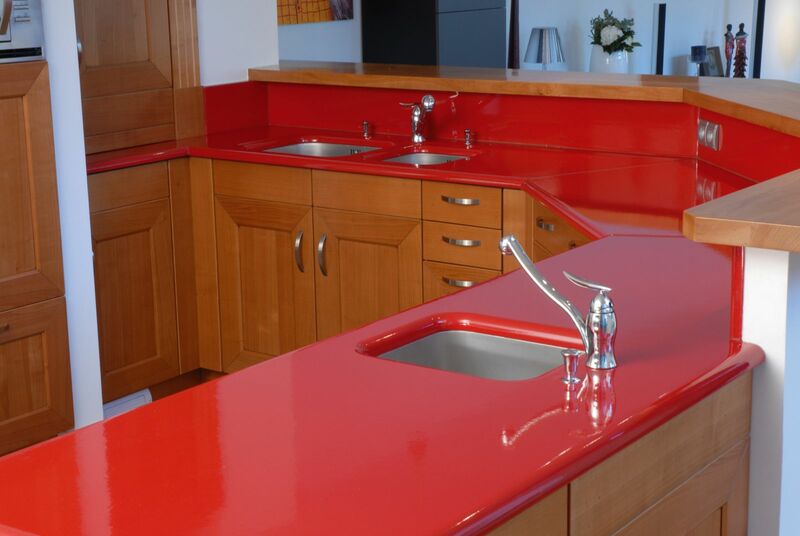 The surface is hygienically non-porous and easy to clean. 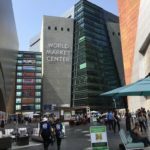 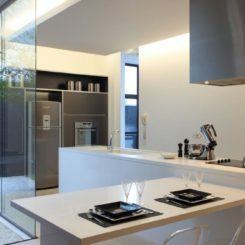 On the down side, of course, is the fact that stainless steel countertops can and will show every greasy fingerprint and smear, as well as scratches. 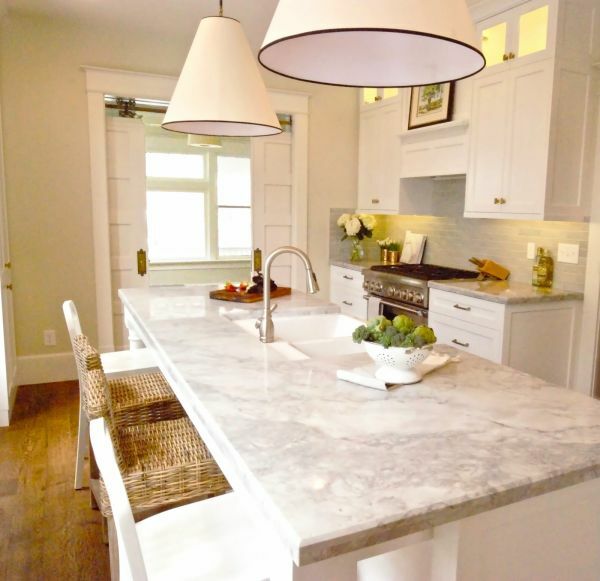 A luxe, natural material with plenty of veining, soapstone makes a gorgeous kitchen countertop. 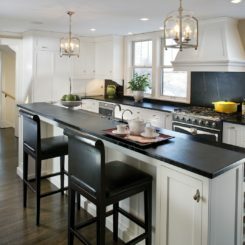 Soapstone countertops look very sleek and chic and complete the look of a kitchen in a variety of styles. 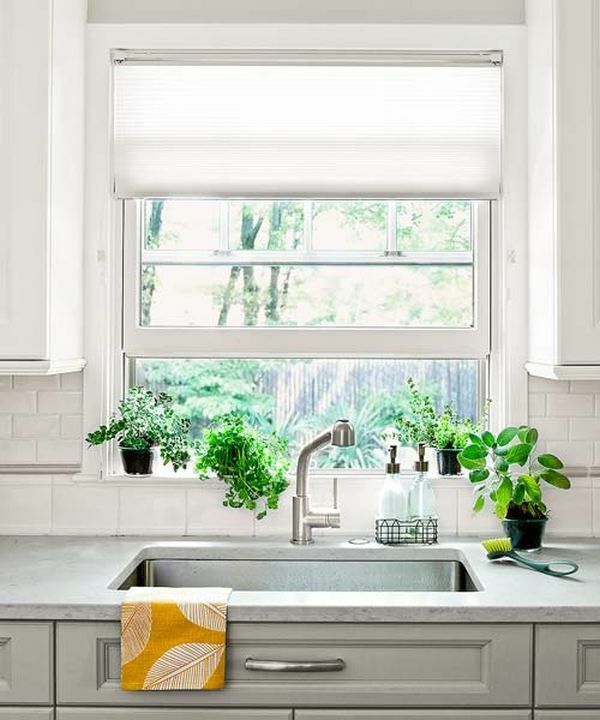 They are also heat-resistant, durable, and unaffected by acids such as orange juice or vinegar (which, let’s be honest, will be spilled at some point in the kitchen’s life). 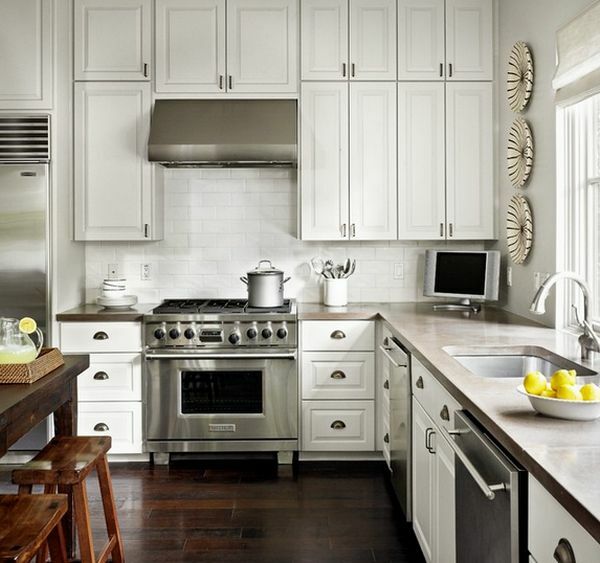 Soapstone does require regular oiling and buffing and can be scratched. 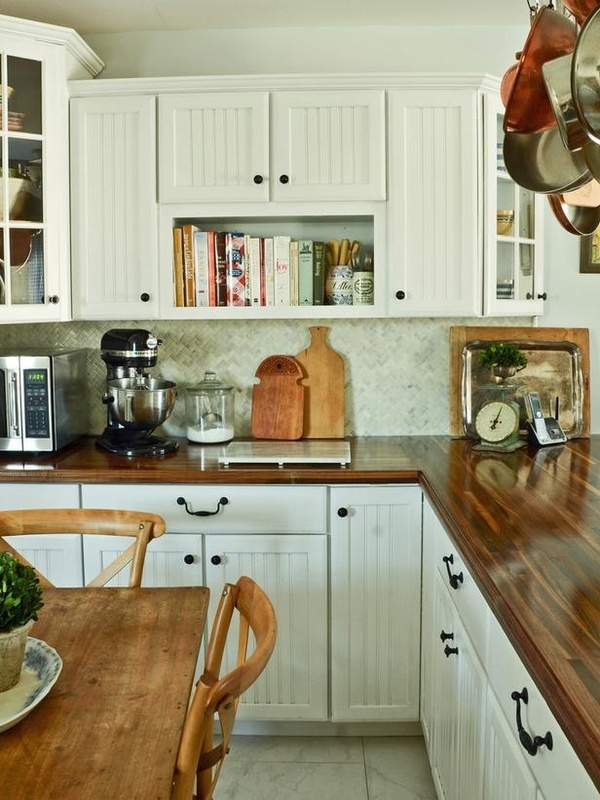 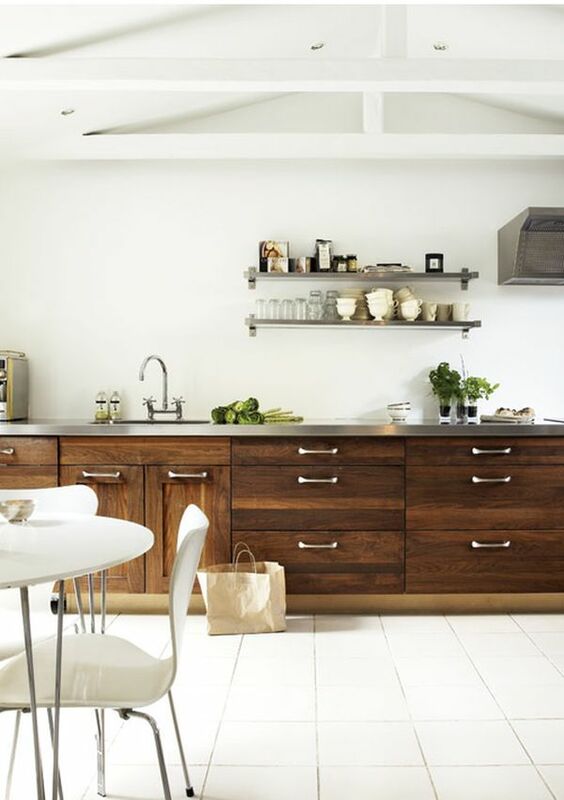 Warm and natural and absolutely earthy, butcher block countertops in the kitchen are a popular choice for serious chefs, historic/period homes, and really anyone who loves wood’s natural warmth and beauty in the kitchen. 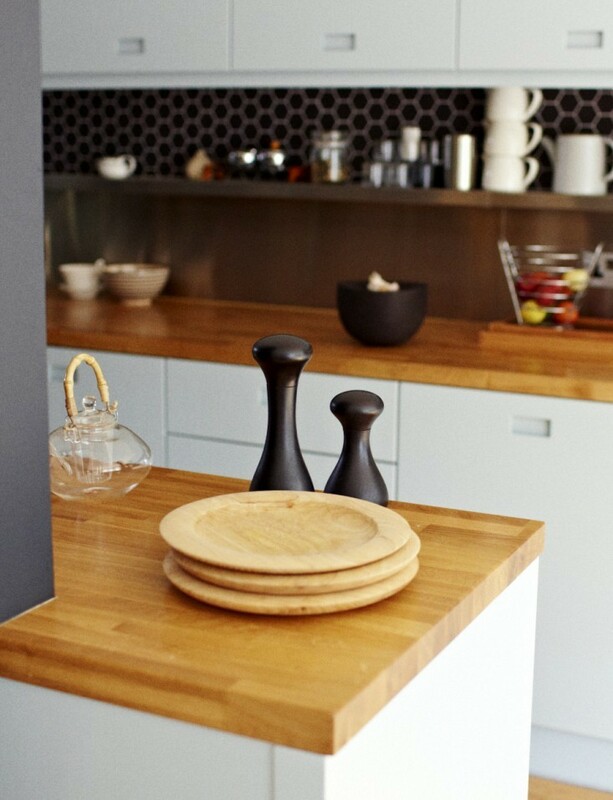 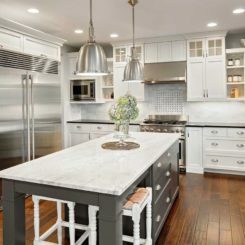 Those considering butcher block as a kitchen countertop option need to decide which of the two finishes best suits their needs – the one for cutting and food prep, or the other for service and display. 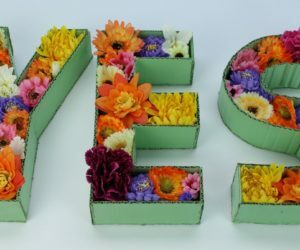 (Obviously, this is a critical choice.) 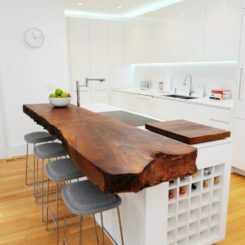 Butcher block requires a bit of maintenance, including regular sealing, oiling, and occasionally sanding and/or resurfacing. 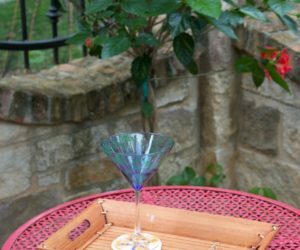 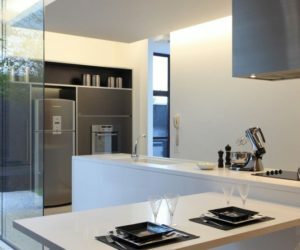 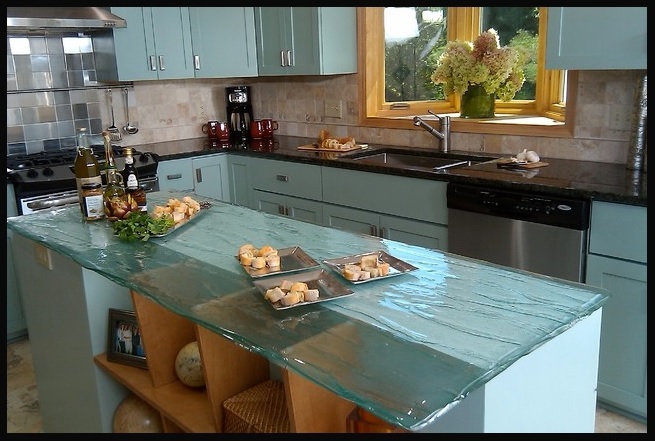 Taking glass countertops one step further, Bio-Glass is an eco-friendly kitchen countertop option, available in a variety of different colors. 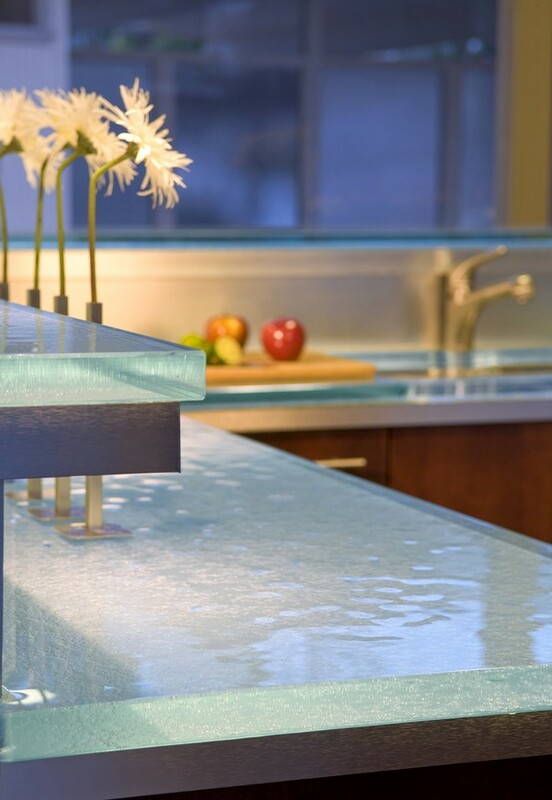 The countertops are manufactured out of 100% recycled glass materials; they are also 100% recyclable. 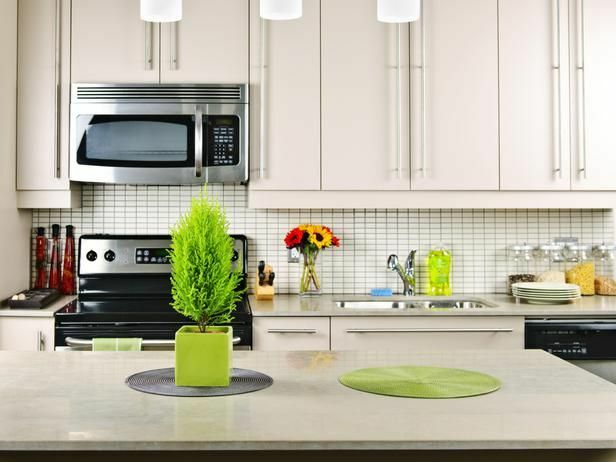 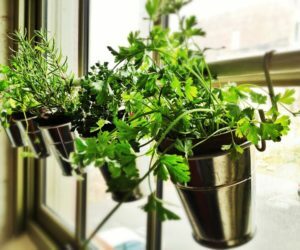 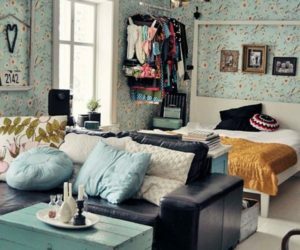 Definitely a great option for those who gravitate toward keeping things green. 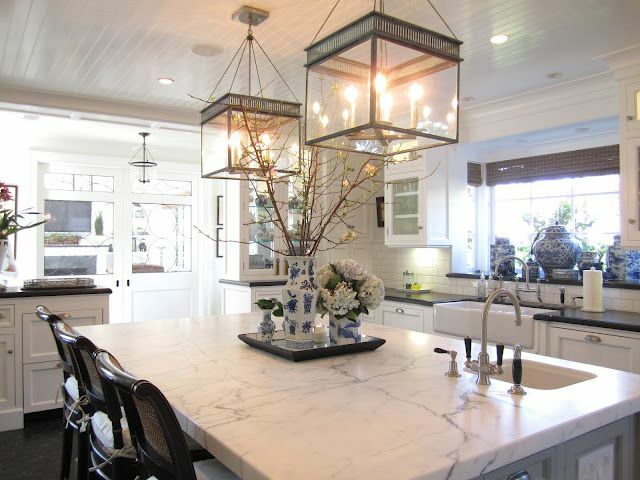 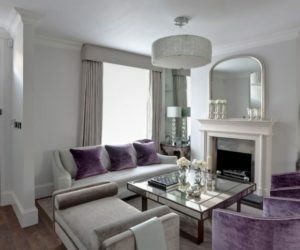 White marble is a timeless classic in the well-designed home. 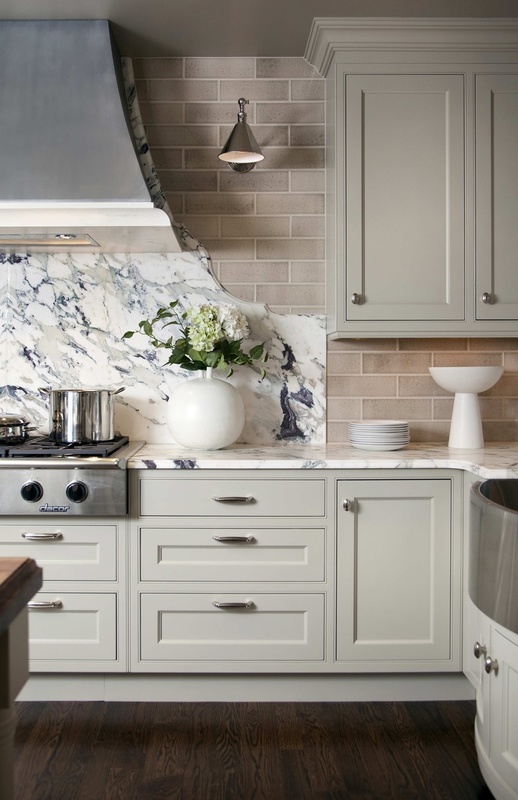 The veining and luxury of marble makes an instant sophisticated statement in any kitchen. 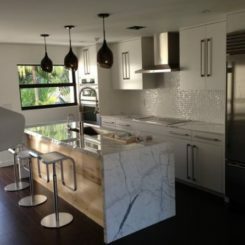 However, marble does scratch and stain easily. 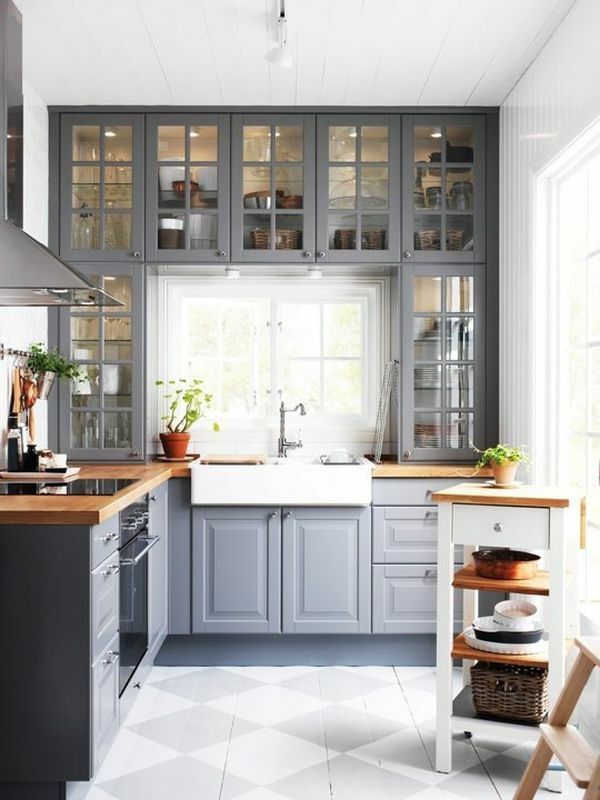 It’s recommended for use in smaller countertop sections, such as an island or baking station, rather than the entire kitchen. 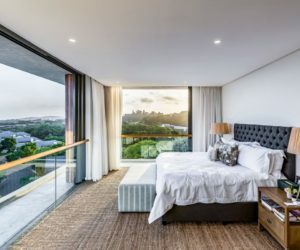 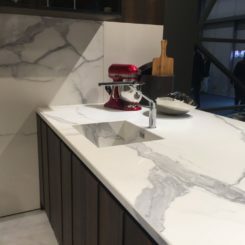 Limestone is an organic substance that often resembles marble, but it has the benefit of being a much tougher, more durable substance for kitchen countertop use. 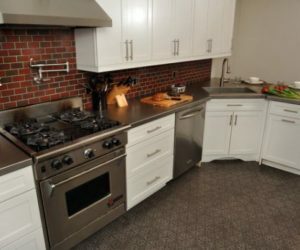 The material is becoming more popular as a kitchen countertop, what with its smooth surface and earthy, organic color options. 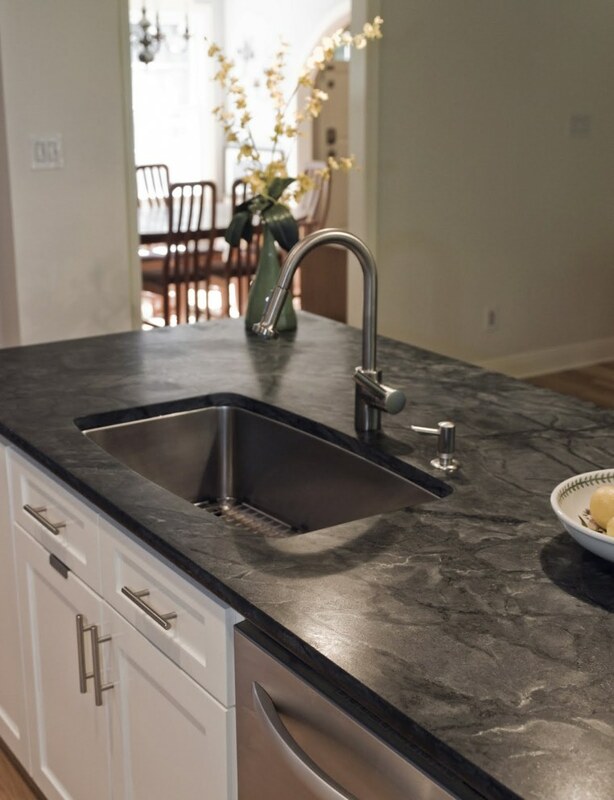 Lesser known but becoming more popular recently, lava stone is a dramatic and beautiful choice for countertops. 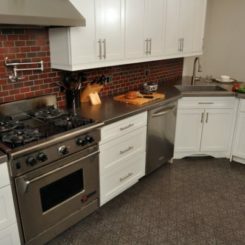 Available in matte or highly glossy sheens and a wide variety of color options, lava stone can be customized to fit any style of kitchen. 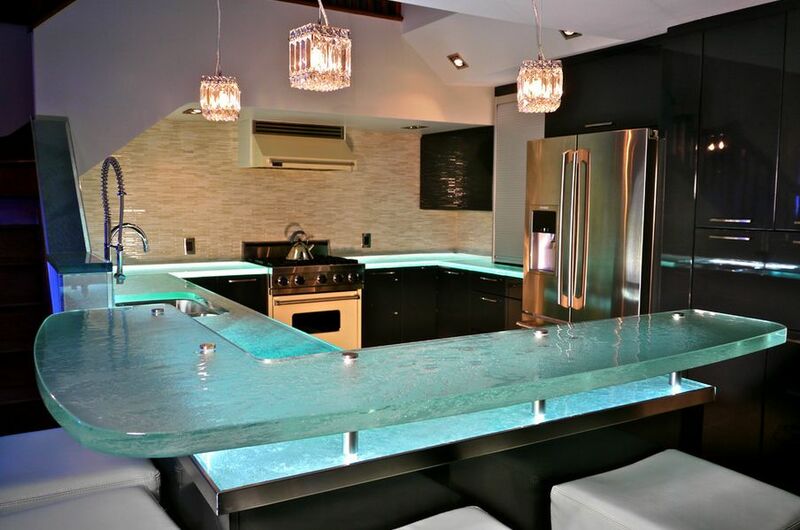 Lava stone is non-porous (similar to stainless steel and glass countertops) and isn’t easily stained, scratched, or adversely affected by heat. 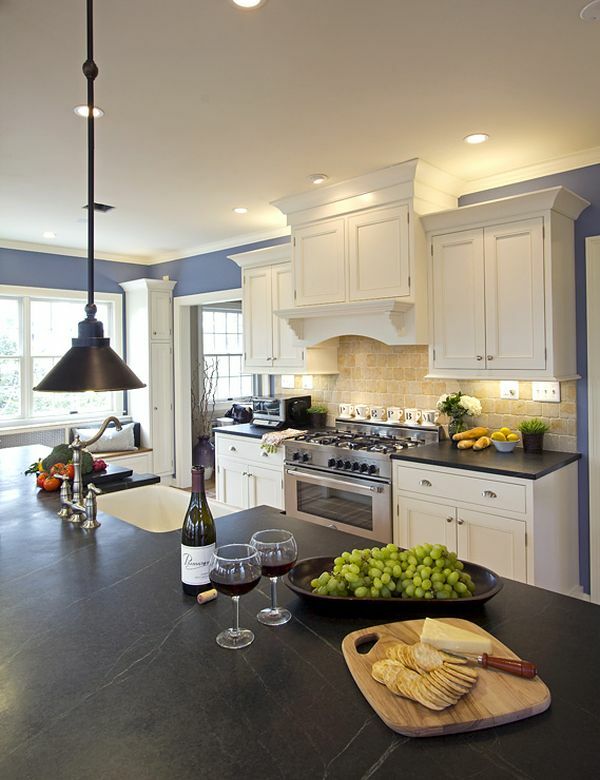 These benefits come at a price, however; lava stone is one of the most expensive options for kitchen countertops today.